I’m beginning to think that my Daring Bakers motto should be “best laid plans” because this was another month of shenanigans. 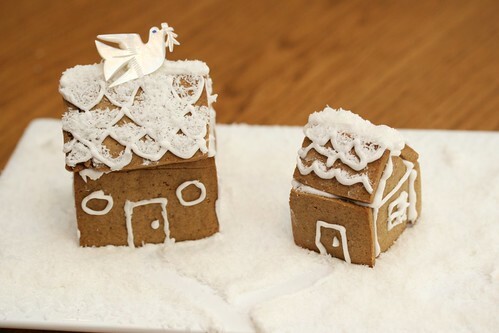 I was very excited when I saw the challenge and started planning a very Aussie Christmas Gingerbread House i.e. backyard cricket, dry grass, tin roof. There were plans and engineering meetings and decoration conferences in the confectionery aisle of the supermarket. I chose Y’s dough because I had all the ingredients in my cupboard and I liked the spices that were involved but I had a few issues with the dough - it came together easily enough but after chilling overnight, it did not roll, it crumbled. So, I stood there smushing it back together to try and get a flat enough thin to cut my wall out of. Finally, I had all my pieces and they had a cooled and it was time for the simple syrup. Let's consider this for a moment. Me + molten sugar + pretty decorationing + tiredness = me burning myself with said molten sugar. And then Esther burning herself on the syrup. So I thought "oh well, I won't decorate it as nicely as I wanted to. I mainly just want to put it together!" So I did. And, holy mackerel, it was ugly. SO UGLY! SO UGLY THERE AREN'T ANY PICTURES! There's another reason why there aren't any pictures. I smashed it. With my rolling pin. A lot. 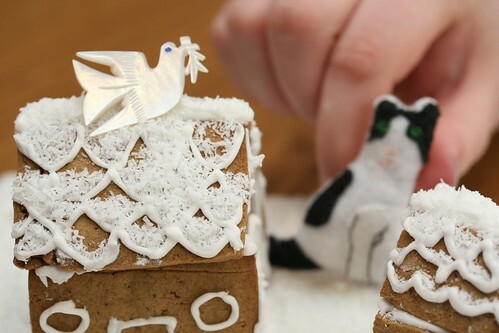 I snapped and had had enough of this ugly gingerbread house - all the time and energy that had gone into the construction for an UGLY outcome was too much for me - it was smashing time. At first, it wasn't very carthatic but then I hit my smashing stride and I felt a lot better. The problem, of course, was that now there was no gingerbread house for the challenge at all. Esther to the rescue! 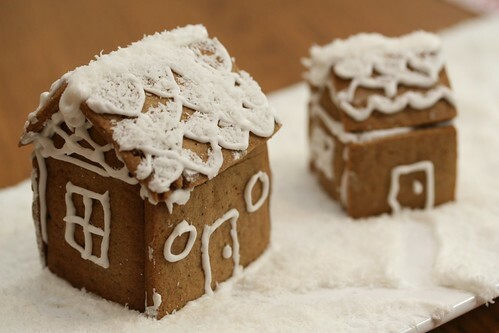 We cut some slices off the (ample) excess dough and made some tiny gingerbread houses. And, if i say so myself, they are about 10000 times cuter than I could have ever imagined. And so adorably cute! They are living on our coffee table and it is pretty funny watching our cats walk next to them as they look like huge panthers attacking the tiny village. So, all in all, a less than successful challenge but I got to work some anger out. The challenge was certainly there and I'm glad that I had a go! Thanks, Anna and Y! It has only taken a year or so for Esther and I to walk the 5 minutes down the road to try out Factory and we are very glad we did! We took the lovely Josie along with us to try it out and we spent a lovely couple of hours eating, drinking and playing scrabble. The menu isn't huge but surprisingly varied! 11 vego options! 1 outright vegan option and other veganiseable (total word, ok) things! Nice looking omin things! Coriander features quite a bit - hooray! I went with the Vegan Brekkie - scrambled tofu with mushrooms, tomatoes, spinach and coriander, finished with a soy & lime reduction. Verdict - a one-way ticket to delicioustown! I love these sorts of flavours at breakfast and it didn't disappoint! A little bit of chilli wouldn't have gone astray but, apart from that, the flavours were nicely balanced and the nice sourdoughy bread that came with it (no butter! they totally got the vegan!) was great to dip in the sauce bit that was left. To be honest, just writing this up makes me want to nip around the corner for some more. Yum. 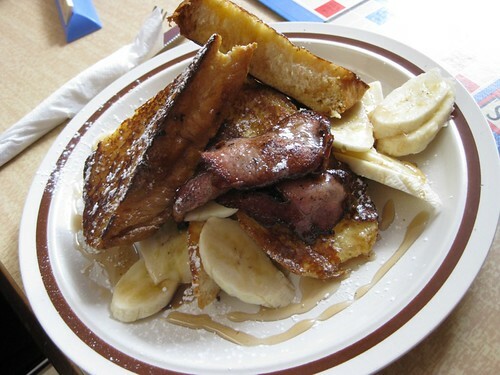 Josie and Esther both went with the French Toast with banana, maple syrup and bacon and it smelt amazing and looked great. Both said that it was delicious - good quality maple syrup, nice fresh banana and excellent flavours. There are a bunch of other things on the menu that I want to try - the ricotta pancakes, the poached pears, the baked eggs with tomato and coriander salsa and haloumi - I could go on and on. The coffee with great, there's a nice courtyard and there are plenty of tables. 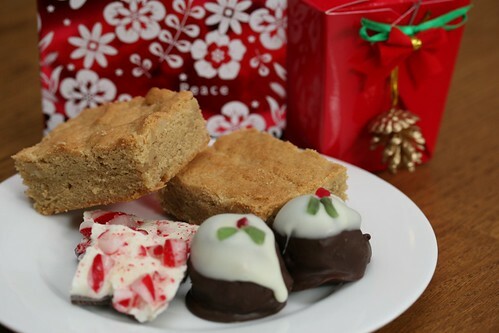 Just a mini-post about my vegan Christmas baking. Except there is no baking involved. There is deliciousness though . . . read on. With all my other Christmas baking being a dairyfest, I needed something to make for my vegan peeps. Josie had told me about this 'recipe' ages ago and I forgot about until I was eating Oreos at the cinema the other night. BRAIN WAVE TIME! 2. Add toffuti and mix. I added a spoonful and mixed it and kept adding until the consistency seemed right. I think it was about half a little tub of tofutti. 4. 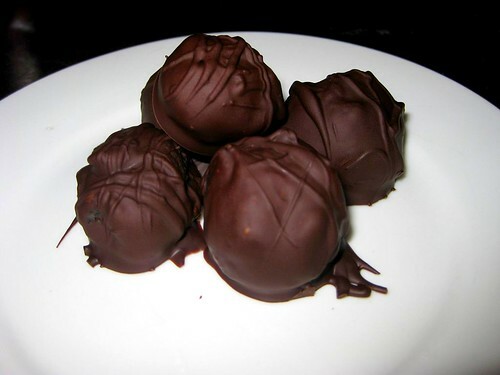 Roll the oreo/tofutti mixture into balls, dip in chocolate and leave to set. I enjoyed them immensely and the vegans seemed to enjoy them too. Easy and delicious! Oh, Birdie Num Nums. I had such high hopes for you and in the end you gave me a very mixed bag. Sunday morning, Esther and I picked up our bffs for breakfast. I had declared that I wanted to go somewhere new so we drove down Nicholson Street where the place I had sort of picked was. It was closed. 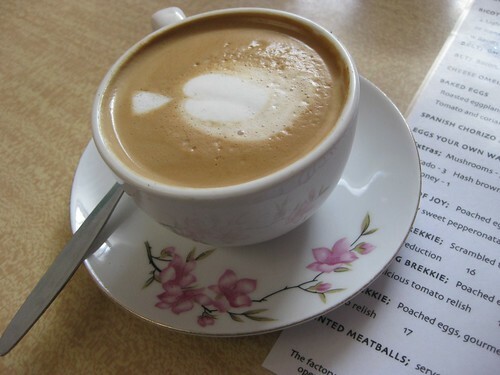 Tip for Melbourne cafes – open for Sunday breakfast. Anyway, we continued down Nicholson Street and arrived at Birdie Num Nums. I loved the interior – it’s previous life as a butcher was very obvious with rails and meat hooks. Unfortunately, breakfast went from delicious to fairly horrible. 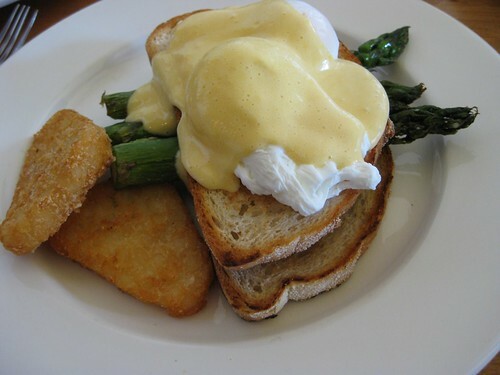 My breakfast (above) was delicious - eggs perfectly poached, hollandaise good, asparagus excellent. The only down side was the insubstantial, airy toast. As Esther said, the bread was like something from Baker's Delight. 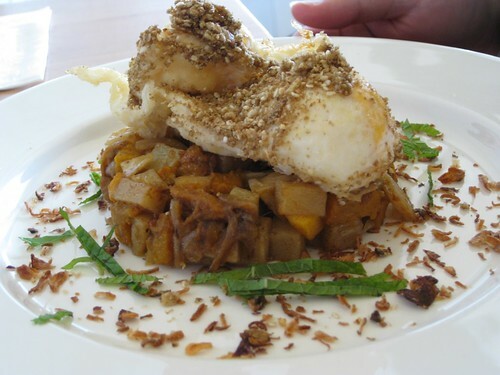 J & D got the Egyptian Eggs - crispy fried poached eggs rolled in dukkah on a potato and pumpkin stack with mint and crispy onion. From what the guys said, they were good but lacking balance. It needed something fresh or some lemon to squeeze over it. And now for the bad - Esther's breakfast. The bacon was undercooked but covered in burnt bits and oil. The sausage was cold. The spinach was overcooked and not seasoned. There was the same issue with the bread as with my breakfast. The hashbrowns were fine but nothing special and obviously from the freezer section. The eggs were meh. She felt queasy for the rest of the day after her breakfast which generally means that place is struck of the breakfast list forever. Farewell forever, Birdie Num Nums. 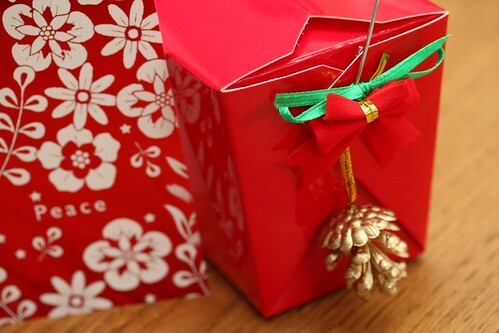 Our gifts were made up of three things - two of which I had seen on the interwebs days before and one which my mum always used to make at Christmas time. 1. 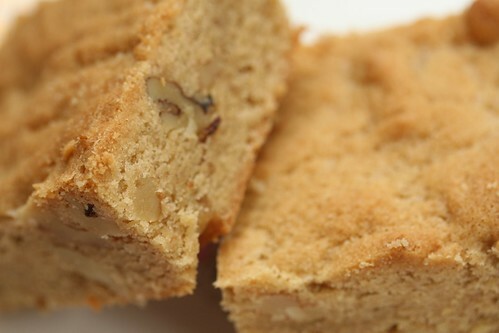 Walnut Shortbread from Lottie + Doof. This was some amazing shortbread - not too walnutty (which was my fear as I was chopping them), 'sandy' and moist at the same time, made of deliciousness. I highly recommend heading over to Lottie + Doof for the recipe. This was also the first post in their "12 Days of Cookies" and each has been very delicious sounding. 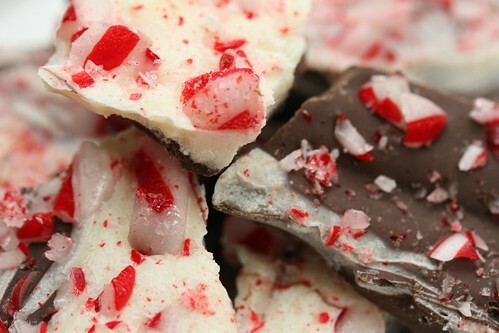 Peppermint Bark isn't a thing in Australia - at least, I've never really noticed it - but it seems to be big in the US, seeing as I've seen approximately 10932890 recipes for it in the last couple of days. In conclusion, melted chocolate and crushed up candy canes - yes, please. 3. Chocolate Boozy Puddings from my mum! As I said, my mum used to make these all the time and they were the most fabulous and impressive thing when you are a littlie. The thing is, they are so easy. 4. Dip in chocolate. Leave to harden. 5. Drizzle/dip white chocolate on top. 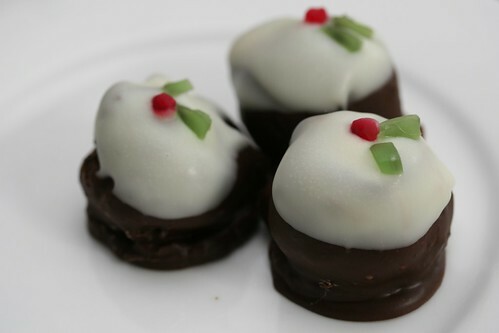 Top with green and red things of your choosing to make holly. So delicious. So decadent. So boozy. Now to make some more. We packed up them up in cute boxes from Spotlight, added a note, packed them in the car and spent Saturday driving around the greater Melbourne area dropping them on people's doorsteps. Yay, Christmas is for the baking! Et in Arcadia ego . . .
I’m sorry for ridiculous overplayed title but I couldn’t resist! After months of studying Tom Stoppard’s Arcadia for Year 12 Lit, I have a fondness for all things Arcadian. And, in retrospect, I should have had rice pudding with jam which I could swirl through it and have delightful chaosy fun. 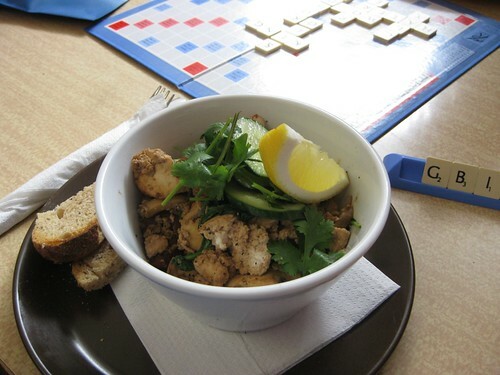 Anyway, our lovely friend AB has just arrived from Qld and it was time for some delicious breakfast, Melbourne-style. I sent her a list of cafe names and told her to choose without any research whatsoever. Without any hesitation, she chose Arcadia (mainly, I believe, because she is living around the corner) and I was very happy with her choice, having had the Most Delicious Savoury Muffin of my life there a few weeks earlier. We got the last indoor table at about 9:30 or so and felt very smug about the whole situation. 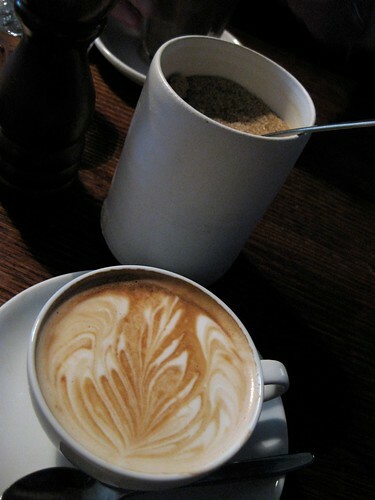 Coffee order was taken straightaway which always makes me happy and we perused the blackboard. My eye was immediately drawn to the mushrooms because whilst I love mushrooms, I don’t cook them at home because they are not Esther’s bag at all. I was also interested in the eggs with chilli – I can’t remember the details but it sounded a bit like the Hot Indonesian Eggs at CERES which is high up on my favourite breakfasts of all time. 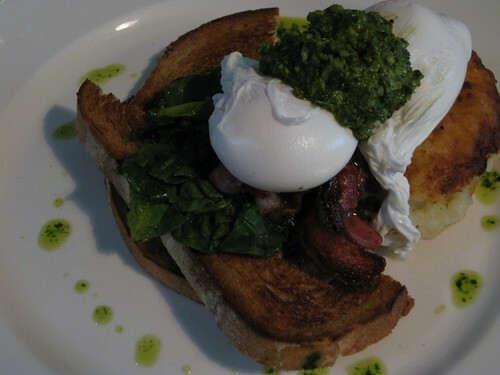 Esther and AB both went with (and I quote) "pan-fried mash potato cake with spinach, bacon, poached eggs, mayo and pesto" and it looked fantastic – I don’t partake in meat anymore but that was some delicious looking bacon. 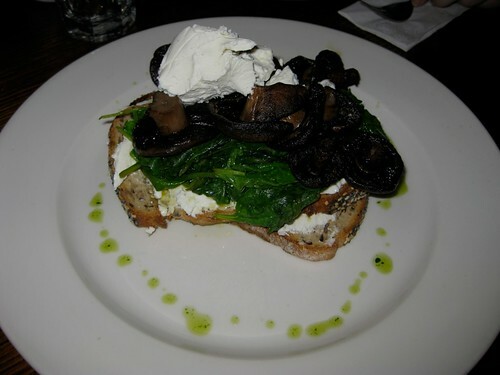 The mushrooms were great and the goats’ cheese was perfect – it’s classic for a reason, peeps. 1. They only do breakfast from 8 to 11:30 (M-F) and 9 to 4 (S&S). I understand that limited kitchen space sometimes means you need to shut down breakfast so you can cook lunch but their breakfasts are so good that I would love to be able to eat them all day. 2. They are a bit pricier than a lot of other places. The quality is amazing though so the extra cost might be worth it.